simulation | What's In John's Freezer? This post will walk through the basic steps we take to do some of the major, ongoing research in my team. It comes from our lengthy project aiming to determine how elephant legs work at the level of individual muscle/tendon/bone organs. We need fancy computer simulations because anatomy, mechanics, physiology, neural control etc. are all very complex and not only impossible to completely measure in a living, moving animal but also extremely unethical and unjustified in the case of a rare, fragile animal like an Asian elephant. We want to do such complex things to test hypotheses about how animals work. For example, we want to estimate how fast an elephant could run if it wanted to, or why they cannot (or will not) jump or gallop like smaller mammals do— even as baby elephants (~100 kg or 220 lbs), which is an ancillary question we’re tackling. That’s cool basic science, and that’s enough for me. But the applications once such models and simulations are established are manifold– human clinical research now routinely employs such approaches to help treat “crouch gait” in patients with cerebral palsy, plan corrective surgeries, aid in rehabilitation strategies, and even potentially optimize athletic performance. Non-human research is pretty far behind this kind of confident application, because there are too damn many interesting non-humans out there to study and not many people using these approaches to study them (but it’s catching on). 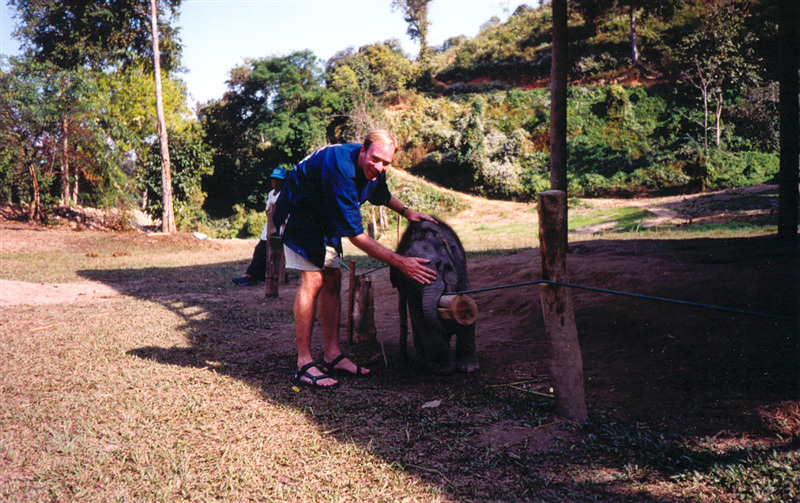 Breaking up the monotony of the text with a baby elephant we met during our research in Thailand (Chiang Mai, here) in 2001. It was just a few days old and VERY cuddly and playful (chewing on everything!) but it’s mother did not want us playing with it so we only gave a quick hello. I use the term model to refer to a simple abstraction of reality (such as an anatomically realistic computer graphic of a limb), and a simulation as a more complex process that is more open-ended and generally uses a model to ask a question (such as what level of extreme athletic behaviour a modelled limb could support). 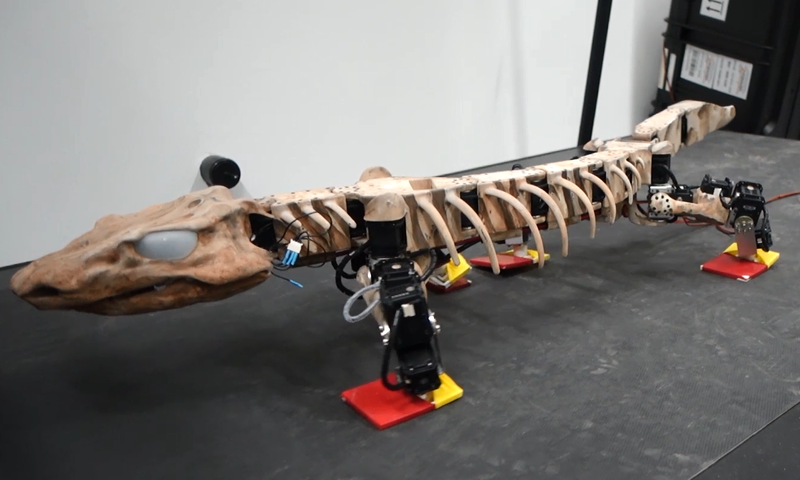 We use models and simulations to test how all the structures of the limb work together to produce movement. This also reciprocally gives us insight into the question, as I like to say it, of why is there anatomy? What is anatomy for? Why does it vary so much within so many groups and not so much in others? 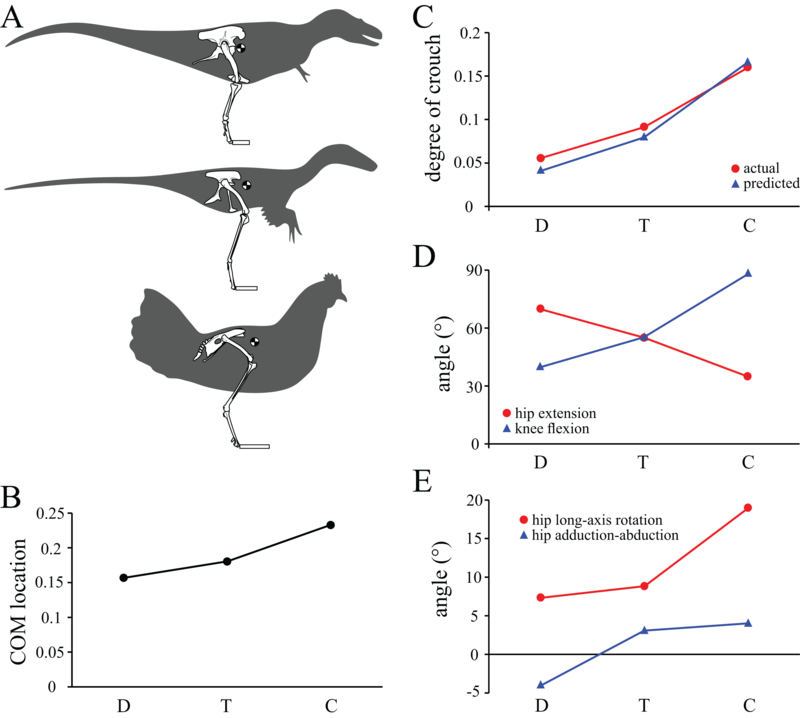 This can more easily be addressed by focusing on the consequences of a given anatomy rather than the more tricky question of why it evolved. These approaches also can answer the frightening question of “Does anatomy really matter?” Sometimes it does not. And those “sometimes” can be impossible to predict- although sometimes they can be easy to predict, too. I think we are not at a point in the maturity of biomechanics/functional morphology to usually know a priori when either is the case. Many factors in addition to anatomy determine function, behaviour, or performance; that’s why; and biomechanics aims to unravel those relationships. A lot of anatomists, palaeontologists, etc. assume that form can be reliably used to predict function, but plenty of studies have shown already (and if you peer deeply into the details, it comes from first principles) that one cannot be sure without either measuring what anatomy is doing in a particular behaviour or estimating that function in a computer model or simulation. Anyway, I’ve covered my perspective on this in a paper which you can read if you want to go into deep philosophical details of the science (and read me blabbering on more about this particular hobby horse of mine?). This post will proceed mostly with pretty images and simple explanations, although I welcome comments and queries at the end. As part of this post, I’ll try to give an idea of the timespans involved in doing the research. Some steps are quick and easy; others can take dauntingly long — especially to do well, without building a digital house of cards. I’ll start, as my posts often do, with a deceased animal, and in this case it will again be an Asian elephant. Incidentally it is the same animal from the “Inside Nature’s Giants” series (see previous post). 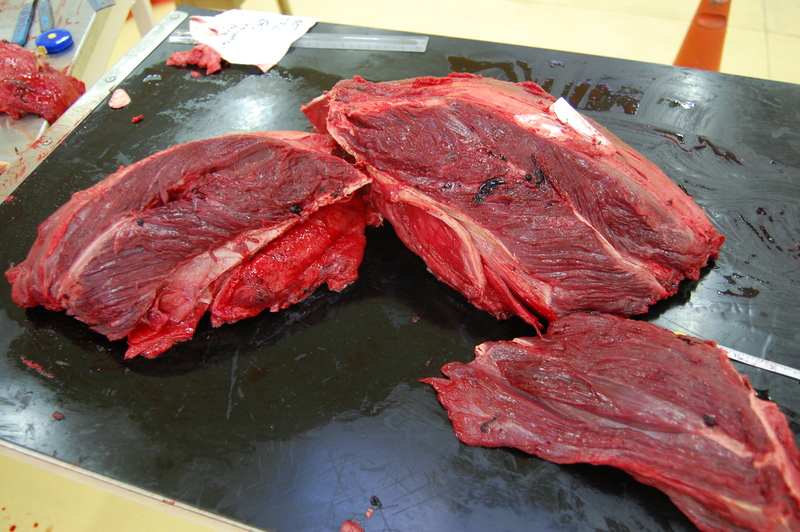 Above: the hindlimb viewed from the rear, showing the medial (inside) region of the thigh skinned down to the superficial musculature. 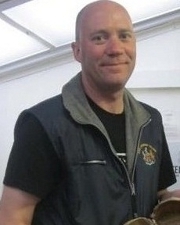 The hip is toward the left of the screen, and the knee is to the far right (whitish rounded area), with the shank (still bearing most of its grey hide) heading to the bottom right corner of the picture. Muscles pictured include ST (semitendinosus) and SM (semimembranosus); major hamstring muscles; as well as the thin, sheet-like gracilis, the straplike sartorius, and the massive adductors toward the top of the image. 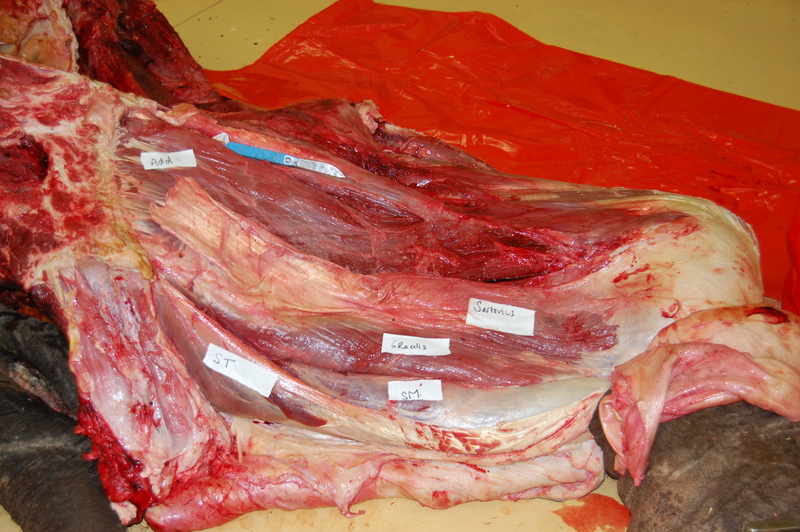 Above: the long muscle fibres (bands running from left to right, somewhat diagonally from the bottom left corner toward the top right) of a hip adductor muscle in our specimen. The adductors are fairly simple muscles that run from the underside of the pelvis to the inside of the thigh (femur). 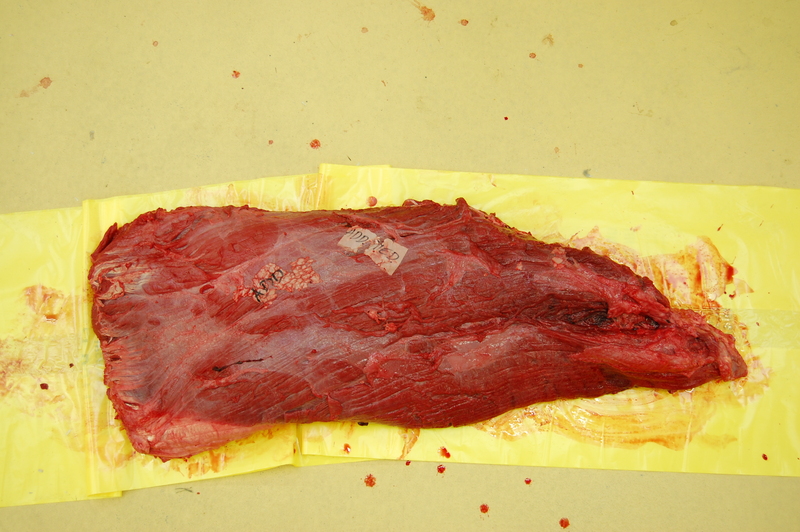 Above: the tensor fasciae latae (TFL; pretty sure of ID but going from memory) hip muscle of our specimen, cut open to show the short, angled fibres (each leading at around a 45 degree angle to attach onto a thick central internal tendon). The TFL is just out of view at the top of the screen in the whole leg anatomy picture above; it is on the front outer, upper margin of the hip/thigh and runs down to the outer side of the knee, invested with thick sheets of connective tissue (fascia). The maximal isometric force (Fmax) of a muscle is computed as the PCSA times the muscle stress (force/unit area), which is fairly conservative in vertebrates. A square meter of PCSA can produce around 200-300 kilonewtons of force, or about 60,000 cheeseburger-weights (the standard unit of force on this blog). That’s a lot of quarter pounders! And an elephant has pretty close to that many cheeseburgers worth of leg muscle (around 150 kg mass, very close to a square meter of PCSA; total Fmax would be around 80,000 cheese-burger weights!). That much muscle is important because an Asian elephant like this one weighed 3550 kg or about 9000 cheeseburger-weights. So if all the muscles in one elephant hindlimb could push in one direction at once, in theory they could hold about 9 elephants aloft. However, as the picture above shows, they do not all act in the same direction. Furthermore, there are many other factors involved in determining how hard a leg can push, such as the leverage of the muscle forces versus the actions of gravity and inertia (mechanical advantage). All those factors, again, are why we need computer models to address the complexity. But the end result is that elephants cannot support 9 times their body weight on one hind leg. Enough talk about cheeseburgers and enough possibly savory pictures of giant steak-like leg muscles. I don’t want to be blamed for hunger-induced health problems in my beloved blog-readership, dear Freezerinos! The above steps take about a week to complete for 2 legs of a big elephant, rushing against decomposition to try to get the best quality data we can. On to the digital stuff- let’s turn the geekitude dial up to 11 with some videos of computer modelling. 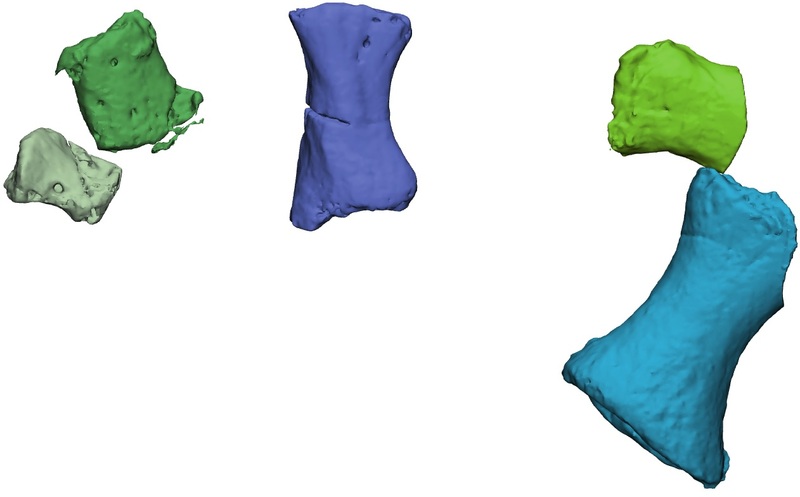 The segmentation step for bones is usually incredibly simple; it can take anywhere from an hour to a day or so, depending on anatomical complexity and image quality. For muscles, this is harder because the images are often more hazy and muscles tend to interweave with each other, segue into tiny tendons, take sudden turns through bones or other narrow spaces, or even fuse with other muscles. So when we do this kind of musculoskeletal modelling, it gets pretty laborious, and can take weeks or months to finish. Ahh, but once you’re done with the basic anatomy, the real fun begins! We take the 3D images of bones, muscles, etc. and import them into our biomechanics software. We use two packages: one commericial item called SIMM (Software for Integrative Musculoskeletal Modeling) for making models, and a nice freebie called OpenSim for doing simulations (although actually we’re finding SIMM is often better at doing both modelling and simulation for more unusual animals). Quite a bit more anatomical work is required to get the joints to move properly, then position the muscles in accurate or at least realistic 3D paths (depending on segmented image quality), then check the muscles to ensure they move properly throughout the joints’ ranges of motion, then import all the PCSA and Fmax and other data we need from dissections, then do a lot more debugging of the model… this takes months, at least. Above: again, a right hindlimb of an Asian elephant. This test of our tracking simulation is replicating real experimental data (from motion capture and force platform analysis) of an elephant running at near its top speed; over 4 meters/second (>10 mph/16kph). The red lines are the individual muscles, and the green arrow is the ground reaction force, equal and opposite to the force that the limb applies to the ground. In a fast elephant that force can exceed the elephant’s body weight, so the muscles need to crank out kilo-cheeseburger-units of force! And that’s about as far as I’ll get today. My team’s previous research (explore links for some fun videos) has shown that elephants can run about 7 meters/second (~15mph; 24kph) and that they have pretty poor mechanical advantage when they do run, so their muscles must have to work pretty hard (about 6 times more cheeseburger units in a fast run vs. a slower walk). So how do they do it? And what prevents them from going faster? What would happen if they jumped? What limits speed more; muscles, tendons or bones? Stay tuned. I’m still not sure how much longer this final step of the research will take… (presumably will precede the heat death of the universe by a long shot) But overall, the whole process when everything works nicely can take a year or so to do, proceeding from whole limbs to a simulated limbs.